Businesses, industry and consumers working together to make things last. The ultimate goal is to keep products and materials circulating in a high-value state of use for as long as possible and maximise resources. This is achieved by designing products smartly with their whole life cycle in mind, re-using and repairing to extend their useful life, and then when their life is deemed over, re-manufacturing to create new products from old. What is a circular economy, and why is it an important concept for business leaders to understand? In a throughput economy, you extract resources from an iron mine or a forest, and use them to make products. Those products are delivered to the customers, and when the customers are done with them, they dump them into the garbage. 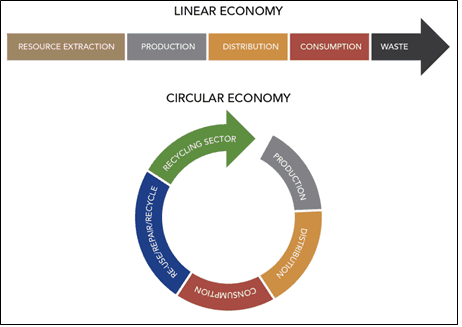 The circular economy aims to radically improve resource efficiency by eliminating the concept of waste and leading to a shift away from the linear take-make-waste model. Early studies indicate Additive Manufacturing holds substantial promise for sustainability and the creation of a Circular economy. Additive Manufacturing – Development of Metal Printing in the local Scottish engineering community is supported as part of Zero Waste Scotland’s Resource Efficient Circular Economy Accelerator Programme, funded by the Scottish Government and European Regional Development Fund. This programme provides funding and support for small and medium sized businesses in Scotland to be more resource efficient and create a more circular economy.